As marketers, we have a tendency to obsess over figures – be it reach and frequency, daily unique visitors or even the number of participants in a survey! It gives a sense of security – if we get a big number, then surely it’s a good thing…? But as the old saying goes, it’s quality and not quantity that matters. Just as different media tend to generate different audience sizes, they also achieve variations in audience quality – some media demand attention, while others are consumed passively. Which begs the question: which would you prefer as an audience for your new campaign – 50,000 engaged consumers or 100,000 disengaged consumers – quality or quantity? In a previous post, I highlighted the flaws of current media consumption measurement – partially due to its weekly collection, but also because it does not capture any sense of the attention given to each medium. An understanding of other tasks conducted concurrently with each activity (i.e. what activities were multitasked with). Whilst I’d be the first to admit the approach has its limitations (e.g. the sample is biased towards online consumers), I think it provides some fascinating insights with sizeable implications. So, which medium demands the most attention? Ironically it’s a medium which has not (yet) been infiltrated by advertising – book reading. PC-based activities (email, internet, gaming) followed; interestingly we concentrate harder on email at work or school than at home, but allocate more attention to the internet at home than at work or school. 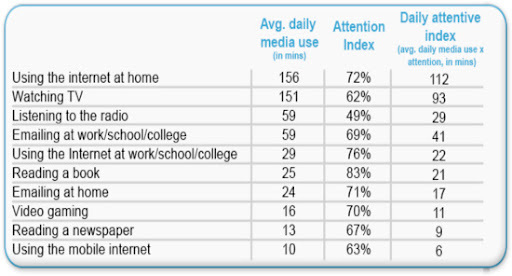 In terms of attention allocated to mobile internet and apps, surprisingly the level of attention is relatively lower than PC-based activity, as was concentration on traditional media like TV and radio, which emerged as the least engaging. Broadcast versus interactive media: Broadcast media such as TV and radio can be enjoyed in an ambient fashion without user interaction, meaning they’re prone to losing out to other ‘interactive’ media if a consumer is multitasking. Time of day: Activities happening in the early evening such as listening to the radio, TV viewing, etc. are done at a time during the day when most consumers are under other demands (socialising, commuting or travelling), whereas an activity such as book reading tends to happen later at night and is slightly more single-minded in nature. Likelihood of multitasking during each activity: Ultimately, the more activities a consumer tries to undertake, the more likely their attention is divided. 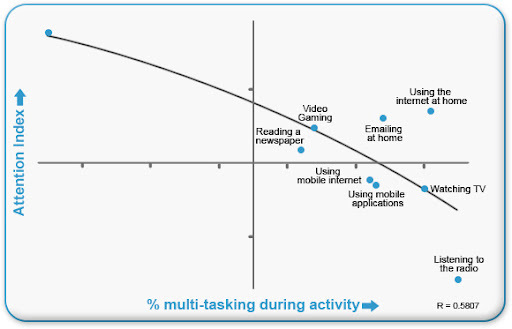 This can be best illustrated in the following graph, illustrating the relationship between attention given to each activity and the likelihood of multitasking during that activity. 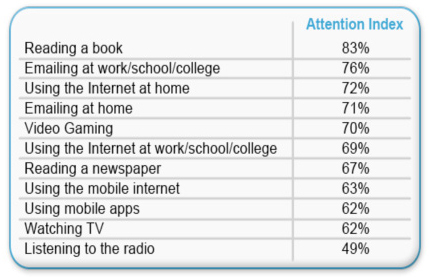 What is most interesting, is that PC internet/email retains attention despite being commonly multitasked. The one conclusion we can draw from this is that it’s the dominant activity whenever multitasked and hence retains more attention than other media. So what are consumers multitasking with what? Below is a graphic showing what people are coupling together when multitasking. People tend to use mobile or PC (for surfing or apps), supporting the hypothesis that the mobile is used when out of reach of a PC. So what…? I hear you say. Well it seems logical that the more engaged you are with a particular media or activity, the more likely you are to notice advertising, or to process information. So if you are buying media, surely you want to optimise your selection to encompass not only audience reach, but also audience attention? To do this, we simply calibrated the typical Australian’s average daily media consumption to take into account the attention they give to different media. Somewhat of a simplistic calculation, but with interesting results (shown below). Ultimately online gets the lion’s share of attentive minutes. Whilst the sample is a little biased towards online savviness (as the survey was administered online) it’s still a clear result with 153 attentive minutes per day per Australian. So what should we take out of this? Consider how you can draw attention through creative elements such as distinctive audio and eye catching visuals. To delve a little deeper into the research, and filter results on different demographics, we created a dashboard widget, which can be accessed here.